The Woodberry Down social housing estate in Hackney, subject of a “regeneration” scheme in which blocks are demolished to make space for private developers to build flats for sale and for a “city academy” school. 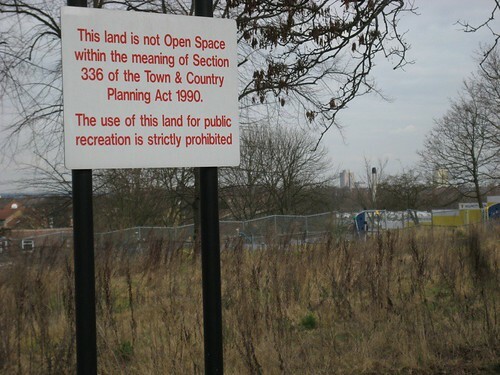 This sign must be a lawyer’s attempt to prevent anyone claiming that the land is public and thus inhibiting its privatisation. The site is a fine hill top with long views. I sent the picture round the pnuk list as a new year greeting and Peter Marcuse replied, saying he would use it in a lecture in Taiwan (with attribution). Nice.